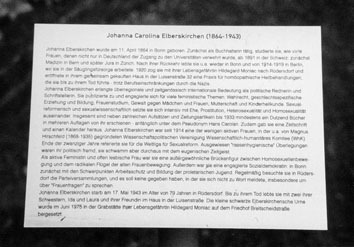 Johanna Elberskirchen was born on April 11th, 1864 in Bonn. Working first as an accountant, she then, in 1891, started her formal studies in Switzerland  like many women whom access to universities (not only in Germany) was denied: initially medicine in Bern and later law in Zurich. After her return she mainly lived in Bonn and between 1915-1919 in Berlin, where she worked in infant care. In 1920 she moved with her long term partner, Hildegard Moniac, to Rüdersdorf near Berlin and opened in the house which they had purchased together - 32, Luisenstraße (today’s 57, Rudolf-Breitscheid-Straße) - a practice for homeopathic treatment which she ran until her death despite Nazi restrictions on her occupation. Johanna Elberskirchen obtained national and international importance as political speaker and writer. She committedly published and spoke out about many feminist issues: suffrage, gender specific upbringing and education, university access for women, violence against girls and women, motherhood and paediatrics. As a reformer and scientist on sexuality she intensely grappled with the problems of marriage, prostitution, heterosexuality and homosexuality. Apart from numerous essays and newspaper articles, she had published at least a dozen books in several editions by 1933  initially under the pseudonym Hans Carolan. In addition she was editor of a journal and a calendar. Johanna Elberskirchen was, since 1914, one of the few active women in the scientific-political association Wissenschaftlich- humänitäres Komitee (WhK, scientific-humanitarian committee) founded, among others, by Magnus Hirschfeld (1868-1935). At the end of the 1920s she gave talks for the World League for Sexual Reform. While acknowledged “racial-hygienic" considerations were politically alien to her, she did move with the eugenic Zeitgeist. As active feminist and openly lesbian woman, she was an exceptional bridge figure between the gay movement and the radical wing of the older Women’s Movement. As a committed social democrat, she worked in Bonn with a main emphasis on health and safety protection at the workplace as well as proletarian youth education. She regularly attended party meetings in Rüdersdorf, and it had been alleged that there was no occasion where she did not put up her hand to speak, in particular, about “women’s issues”. Johanna Elberskirchen died on May 17th, 1943 at the age of 79 in Rüdersdorf. Till her death, she lived with two of her sisters, Ida and Laura, and her girlfriend in the house in the Luisenstraße. The small black Elberskirchen urn has secretly been installed in June 1975 in the tomb of her partner Hildegard Moniac at the cemetery Breitscheidstraße. Activist for the Rights of Women and Homosexuals"